Patrick Toon in R3G. Photo by Neal J. Freeman. BOTTOM LINE: Part Shakespeare, part Ray Lewis, part funny, part perplexing. America’s love-hate relationship with 2-time NFL champion and Ray Lewis -- who was indicted on murder charges in 2000 and ultimately convicted of an obstruction of justice misdemeanor following a plea deal -- is writ large in Bloody Shakespeare’s Richard the Third and Goal, or R3G. 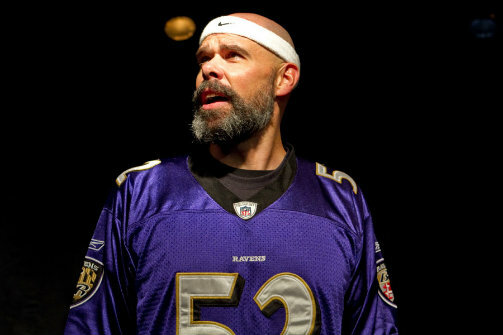 Playwright/director Neal J. Freeman’s text is assembled entirely from pieces of Shakespeare’s Richard III, and pull quotes from Lewis’ career as a Baltimore Ravens linebacker, as the production mashes the low brow of the American football machine with the high brow of Shakespearean iambs. The cast of three -- Patrick Toon, Minna Taylor, and Montgomery Sutton -- handles this poetic lovechild quite admirably, and their technical skill with heightened language often lends itself well to Lewis’ own particular linguistic height. While the characters are sometimes hard to track (each actor is given their own helping of Ray-isms, making the Richard/Ray comparison taxing to follow) there is something quite entertaining about the absurdity of Lewis’ overzealous commentary in the context of Shakespearean tragedy, and the company’s commitment to giving the two worlds equal weight creates moments of unexpected ridiculousness. Although it must be said there is something equally uncomfortable about three Caucasian actors using the grammatical fumbles of a black celebrity as fodder for comedy. While the confluence of source material is clever and whimsical, and the resulting word-hurdles make for interesting performances, the play lacks clarity and the mash-up convention demands its own mental acrobatics that cloud the comedy and the story more often than not. Moments of seamless and effortless transition between the Baltimore gridiron and the English battlefield are rewarding, but they are too few and outnumbered by confusing shifts and suggested, but unresolved, parallels.